-Fellowship of the National Postgraduate Medical College of Nigeria, Fellowship of the West African Postgraduate Medical College or equivalent in the relevant specialty from a recognised Institution. 5 Medical Laboratory Scientist GL 10 B.sc in Medical Laboratory Science from a recognised University and evidence of registration with MLCN. 6 Medical Laboratory Technician GL 07 Candidates must have successfully completed a three year training programme in a recognised institution and the registration of the Institute of Medical Laboratory Technology of Nigeria for Technician Cadre. 8 X-ray Technician GL 07 Candidates must have completed a three- year training programme in a recognised health institution. 9 Biomedical Engineer GL 09 A degree in Biomedical Engineering from a recognised institution. 14 Community Health Technician GL 07 Candidates must have successfully completed a three- year training programme in a recognised health institution and the registration of the National Council for Community Health Practice Board of Nigeria for technician cadres. 17 Inspector of Taxes II GL 08 Bachelor’s degree in Accounting, Business Management, Banking & Finance, Business Administration or Economics obtained from a recognised Institution. 38 Planning Officer II G/L 08 Bachelor’s degree in Economics preferably with Statistics, Econometrics or Development Planning as a subject from a recognised University. Please note that only qualified applicants would be shortlisted for oral interview. 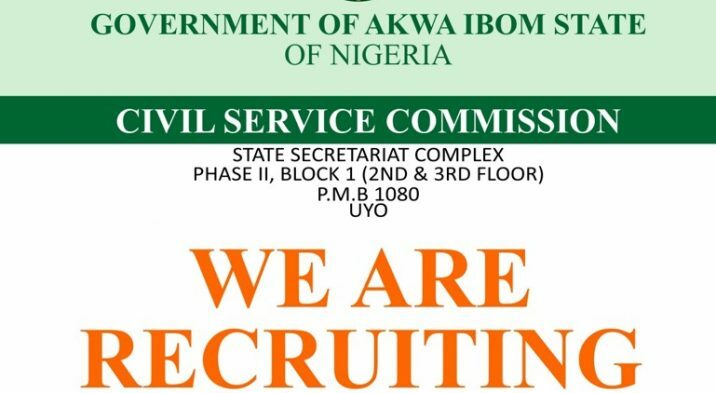 ©2018 Akwa Ibom State Civil Service Commision. All rights reserved.